“I found it!” Robert Hernandez screamed across the desert. When we finally caught up with him, he was staring at two neat rows of sun bleached rocks. Our guide from the local Torres Martinez Cahuilla tribe confirmed for the students that these were fish traps laid by early tribe members, possibly from ancient times. Instead of pulling out a Canon, I scrambled to free our 360 degree camera, audio kit, and ten-pound tripod from their wrappings. 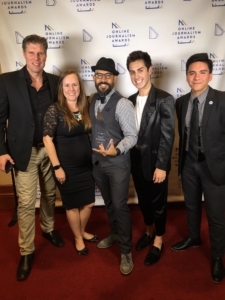 The ingenuity to capture this breathtaking landscape in 360 degrees was rooted in our desire to connect with communities in an authentic way and is part of why the our final project – a documentary – is the winner of the Professional/Amateur Student Online Journalism award. 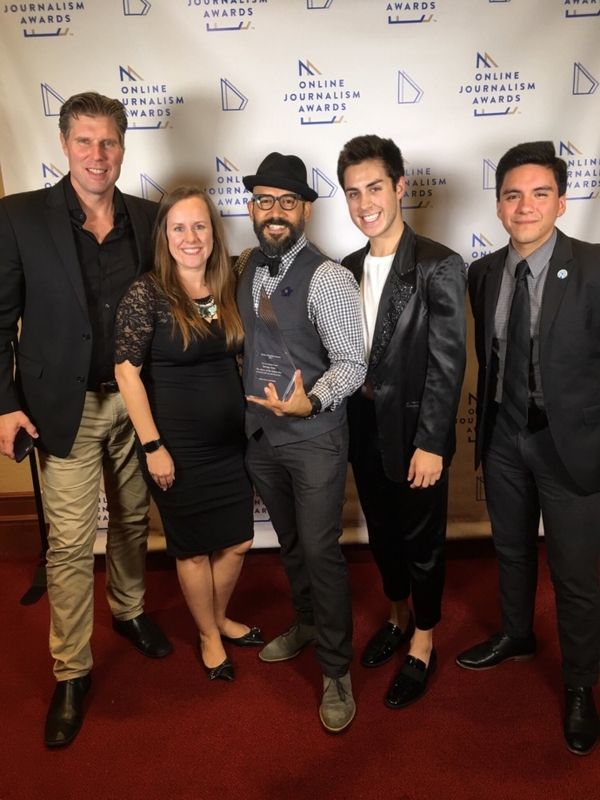 For the past five semesters, Robert Hernandez’s immersive journalism class and his JOVRNALISM collective have traveled around the country to tell stories with virtual reality, augmented reality and other innovative platforms. The seed of each adventure begins most years in the AnnLab collaborate space, where students dare to create their own curriculum through semester long class projects or small project Robert calls “side missions”. “Part of the secret sauce of this class is giving the students ownership of the class,” Robert says, “I like changing the framework of ‘I’m the professor and [you should] listen to me and here’s a quiz’. ” As we blueprinted our dream projects, the hidden world of spacial audio, Oculus, and drones become a second home. The medium captures the imagination of the students but our collective attention to storytelling and our journalistic approaches remains central. It’s why in the spring of 2017, taking on the story of the Salton Sea seemed an appropriate challenge when the local Palm Springs paper, the Desert Sun, approached Hernandez. The Sun came to us with a dire story–The Salton Sea is California’s largest lake, and next year, the state government is shutting off water that keeps the lake full. This could potentially cause a dust bowl to form, and toxins that were formally at the bottom of the lake could become airborne. When we dug our tripods into the dry valley dirt, it became clear that we weren’t just innovating for the sake of innovating– our task was to bring a whole world to people’s doorstep. “The location is surreal. It’s like being on another planet. The history is so fascinating and its future is so fragile,” said Hernandez. And unlike other projects that the class has done, Turning Tides: The Story of the Salton Sea captured intimate vignettes of life on the edge of environmental hardship. The week of spring break that we spent out between dry lake bed and abandon towns showed us that the medium of 360 video became a sturdy bridge to build empathy on because of its immersive quality. A bridge that lead into the lives of children who had developed asthma from breathing the thick toxic air of the building dustbowl and to the shores of the lake that can have hundreds of washed up fish caracases. Some student and I were lucky enough to participate in an Easter celebration on the Torres Martinez Reservation and Drew Schwendiman, one of the student producers, still remembers those moments fondly. Drew had a special connection with one of the tribe members, Tisha Auclair-Vega. “We were making paper mache flowers with Tish,” Drew said, “the whole purpose of [the event] was for the Torres Martinez community tocome together and bond. Even there Tish opened up a bit about her hopes for the kids. What made an impact on me was when she said she wanted [the kids] to tell their stories themselves. 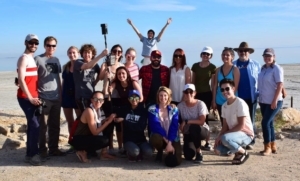 For the first time since being at USC I felt like I had a sincere impact.” Given that the effects of the Salton Sea will reverberate in the years to come, the impact that Drew envisioned for the community will be felt by future audiences as well. When we finally launched our full documentary, the final project neared 30 minutes– the longest product that Robert’s class has ever produced. We labored for months to shorten it, but we knew we couldn’t do the story justice if we cut anything out. Today I still produce 360 degree videos, but nothing has compared to the heat of that desert sun and shooting with Robert. I will never forget my peers describe our drone swooping above a lettuce farm at dawn and watching the farmers below, stare back into the eye of the drone, and into the eye of the future.